Frank Sinatra Original Clown Oil Painting. An avid and skilled, painter, Frank Sinatra produced numerous accomplished artworks during most of his adult life. 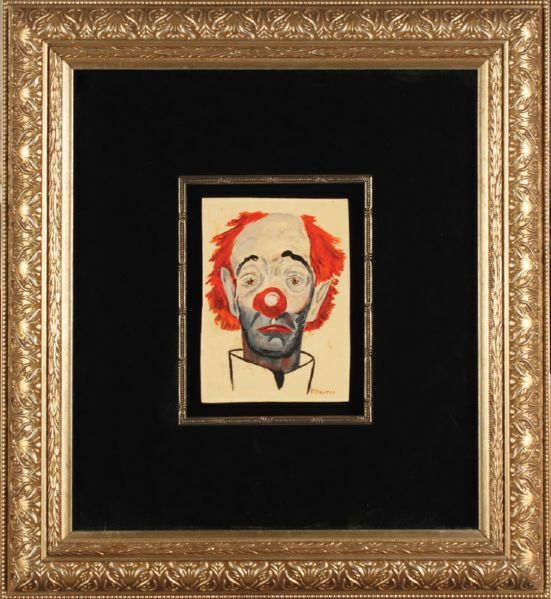 This 5" x 7" oil painting depicting a melancholy clown was painted by Sinatra during the 1960s and given as a gift to his closest friend, Jilly Rizzo. The clown has many facial characteristics similar to Sinatra himself -- perhaps an unintentional self portrait? Signed by Sinatra in the lower right corner. Oil paint on thick paper. Framed and matted to measure 18.75 x 20.75. Very good condition. Comes with a Gotta Have Rock & Roll™ Certificate of Authenticity. Auction closed on Saturday, March 31, 2012.